When you move to a new city/country/place it’s hard to immediately make it feel like home. I’ve found that books help that a lot. So even though my suitcase space is extremely limited, and I’m staying in Barcelona for just 3 months, I’ve already bought 3 books in a wonderful second-hand bookshop Hibernian, which you should totally check out if you happen to be in Barcelona and are a book freak :) The Unlikely Pilgrimage of Harold Fry is one of the books I immediately decided on buying, because I’ve heard only good things about it. Quite predictably, I was not disappointed. 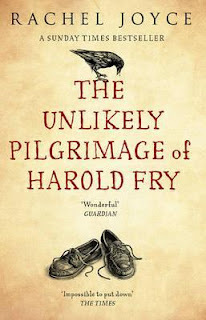 The plot is reminiscent of that of The Pilgrim’s Progress (which I hated) but is much more secular and “modernized”. Harold Fry is an elderly man who once gets a letter from an old friend with whom he lost connection long ago. The friend writes that she’s in hospice with terminal cancer and sends her goodbyes. Harold, instead of penning a sufficiently compassionate and polite answer, decides to walk all the way from the south to the north of England, believing that while he’s doing this, his friend will live and wait for him. Being alone in the wild makes him re-think a lot of things in his life and he meets a lot of different people on the way and gives an ear to each of them. At home, his wife, shocked by his sudden departure, has her own thinking to do. After all, their family has been through a lot. Sometimes the tone of the book verges on being too pathetic, but generally it’s casual enough to not irritate. Certain places are very touching, and there’s also a well-done unreliable narrator(s) aspect to the story. I love that! I also tend to enjoy the type of narratives in which protagonist meets all kinds of incidental acquaintances. It always amazes me how interesting people are if you approach them without prejudices and with an open mind. I felt about this book about the same as you did. There were some sweet moments, but.....a bit sappy at times.